CBUS’s new Melbourne $1.25 billion Collins Arch development—nicknamed the “Pantscraper”—is on schedule and slated for completion in late 2019, says The Urban Developer. 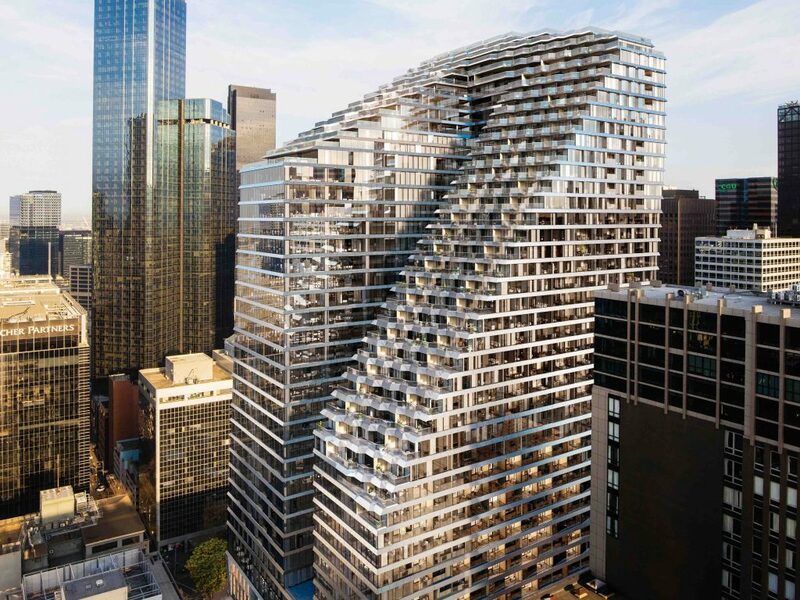 Developed by Cbus Property and commercial property investment group ISPT, the Collins Arch will offer more than 50,000 square metres in office space, and will also feature Melbourne’s first five-star W Hotel with 294 rooms, 1,000 square metres of retail and 185 luxury apartments. Named after its 447 Collins St location and the bridge connecting the tops of its two 41-storey towers, Collins Arch will maximise views and sunlight for occupants and comes with indoor air quality monitoring, access for cyclists that won’t require them to share entry to the building with cars, and WELL Precertification to a platinum level from the International WELL Building Institute, reports news.com.au. Onsite gym facilities as well as healthy eating choices at its retail precinct are also part of the project’s push for a healthier workforce. Penthouse residents on levels 38 and 39 will occupy some of Melbourne’s most covetable residences, with lavish indoor and outdoor living spaces. Six storeys were removed from the original design to alleviate concerns that the skyscrapers would shade the north bank of the Yarra River. Key to the design is the fact that there are no roofs, only terraces. From the open crown at the apex, the building cascades down as a series of spectacular, stepped terraces allowing for most of the building program to be habitable by humans or plants. “We’ve optimised each floor plate and each typology to emancipate half of the site back to the city as public open space,” Woods Bagot principal Kate Frear told industry journal Architecture & Design. “Through a huge engineering feat, we’ve unified the program which ties the whole scheme together and enables all-important sunlight to reach deeply into the site and into the building. “The public space is defined by how people will move through the building, and from the top down. The building program at ground level completely informs what happens above,” she added. A major drawcard for local government in approving Collins Arch was the allocation of half of the site to public amenity. An inclusion within Collins Arch is the 1,900sq m Market Street public park, Melbourne’s first park in 40 years. The 1,900sq m public park comprises City of Melbourne land and a portion of land contributed by Cbus and ISPT. Cbus Property and ISPT are contributing to the development of the park, which will be vested back to the City of Melbourne for public use and management. Among the tenants already committed to the tower are law firms Minter Ellison, Gadens, King & Wood Mallesons, and HWL Ebsworth Lawyers.